Summer usually calls for some lighter whites and roses for the patio along with some heavier reds and whites for the BBQ. It is definitely not the time to bring out your most expensive wines. Summer wines need to be casual since the outdoors does not help you enjoy your better wine’s subtle aromas. Your biggest enemies to enjoying your wine outdoors are temperature and BBQ food flavours. So, here’s how to get the best from your wine while sitting in your Muskoka chair. 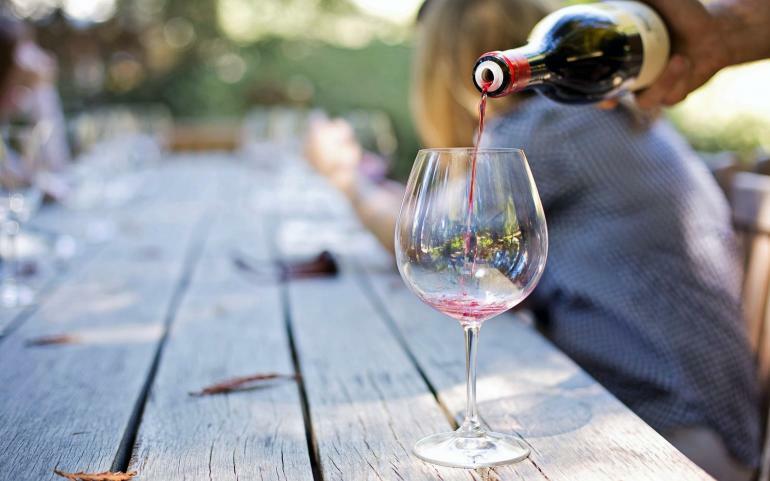 Temperature – Wine sitting in the sun heats up quickly. Warm wines seem harsh, especially red wine. The solution is chilling your sparkling, whites, and roses in the fridge for 2-3 hours and reds for 20 minutes before serving them. When you’re outside, if your wine gets too warm, put it in an ice bucket for 5-10 minutes to keep your reds cool and your sparkling/whites/roses cold. BBQ marinades/sauces – These tend to be sweet and spicy, which decreases the wine’s fruitiness. So, remember that your red and white wine will need to have bigger fruit flavours to stand up. Otherwise, the lovely fruit flavours in your glass will seemingly disappear. Now that you’re armed to better enjoy your summer wines, let’s look at a few to put in your glass! The Ned Sauvignon Blanc 2014 ★★★★ $17.00 (LCBO) A very good medium bodied, pale lemon yellow wine from New Zealand that would be a pleasure to sip on the patio. It has gooseberries, citrus, and a grassy, herbaceous character that makes it a refreshing glass to enjoy. If you want to have it with food, light appetizers and salads would work well. Inniskillin Pinot Grigio 2017 ★★★ $14.95 (LCBO) The medium body and flavours of this Niagara white remind me more of an Pinot Gris from Alsace than an Italian Pinot Grigio. A good wine, it has a quite lovely coppery colour, followed by flavours and aromas of lemons, apples, some green herbs, and a little yellow plum. Serve it as an aperitif, with appetizers, or light seafood from the BBQ. Cathedral Cellars Chardonnay 2015 ★★★★+ $16.95 (Vintages) If you want a very good to excellent, full bodied white for some grilled salmon or pork, this is your wine. Expect vanilla, cream, limes, yellow apple, and some toasty oak spice notes along with terrific acid balance. It’s one of my favourite warm climate chardonnays from South Africa. Flat Rock Cellars Chardonnay Unplugged 2016 ★★★★ $17.95 (Vintages) From one of my fav warm climate chardonnays, we move to one of my much loved unoaked, cool climate ones from Ontario. It has lots of cream from resting on the lees here, as well as lemon and green apples and good energizing acidity as well. Try it with chili lime marinated chicken. Paul Delaine Cremant de Bourgogne Brut Reserve NV ★★★★ $20.45 (LCBO) This French sparkler is a great value. It’s a medium bodied blend of Chardonnay and Aligote that shows yeasty sweet rich bread, sweet yellow apple, lemon, and yellow plum. If you are looking for something to pair with your summer brunch or lunch, this is for you. Three of Hearts Rose 2017 ★★★★½ $19.95 (Vintages) Brought to you by the crew at Henry of Pelham in Niagara, this is a unique Rose made with Pinot Noir. It’s beautifully pale and dry, with ripe red cherries and strawberries finishing with a little herbal rhubarb. It makes a nice wine to take you from aperitif through to your main, or try it with your weekend lunch. Yalumba The Strapper GSM 2014 ★★★ $19.95 (Vintages) The GSM stands for Grenache, Syrah, and Mataro (more commonly known as Mouvedre) and is a commonly used short form in Australia. This wine has intense black pepper, earthiness, savoury red plums and raspberries with a medium body. It has lots of fruit; so, it will work well with anything spicy from the BBQ such as blackened chicken or vegetables dusted with chili flakes. Konzelmann Pinot Noir 2016 ★★★ $15.10 (LCBO) This medium bodied Niagara Pinot has red cherries, hints of wet earth, and soft tannins. It would make a nice accompaniment to BBQ salmon, grilled chicken, or BBQ skewers of mushrooms brushed with olive oil. Concha y Toro Marques Casa Concha Cabernet Sauvignon 2016 ★★★★½ $22.95 (Vintages) As Cabs go, this one from Chile hits all the right notes. It’s intense purple and exudes black currants, blackberries, black cherries, minty eucalyptus, and a little bit of tobacco. It full body and medium tannins would make it a brilliant pairing for BBQ steak. Lake Sonoma Winery Dry Creek Zinfandel 2014 ★★★★ $26.95 (Vintages) This is a smooth operator if you like California Dry Creek Zinfandel. It is intensely coloured and full bodied radiating blackberry, black cherry, dark plums, sweet spices, vanilla and coconut. BBQ Hot Italian sausage or grilled ribs with BBQ sauce would be a happy pairing.